In the run up to the festive season Jane Doxey our creative director has invited talented Makers to run masterclass workshops in various craft techniques and going forward into the new year we hope to offer more and more Adult craft and art classes and this will be particularly for those that would like to try their hand at something new or further explore their creative and artistic flair. 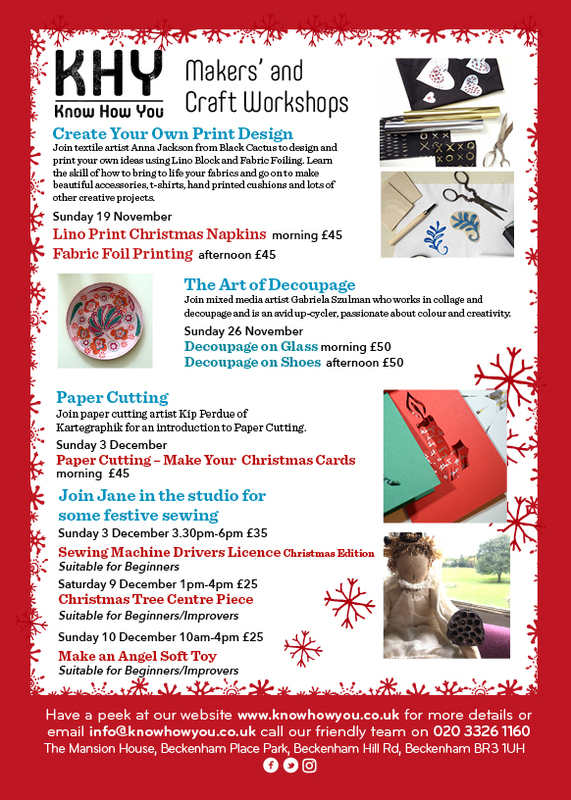 So join us in our craft movement this festive season and learn to papercut Christmas cards and of course gain a skill to create unique celebration cards for your loved ones. Paper Cutting has hit the headlines recently with a young artist Rich McCor making a paper trail of London remodelling iconic landmarks using clever paper cut-outs and his camera. Keeping KHY on trend. For your Christmas table we have fabric foiling on napkins, our unique Christmas Tree Centrepiece and transform your serving dish with decoupage on glass. For Christmas stockings we are making Angel soft toys. Don’t forget to pop into the studio and see us on Thurday mornings from 10am for our Free Sewcial classes, hand sewing is incredibly relaxing and calming. Mix this with social chit chat and a cuppa for a bit of lovely time out from the usual.